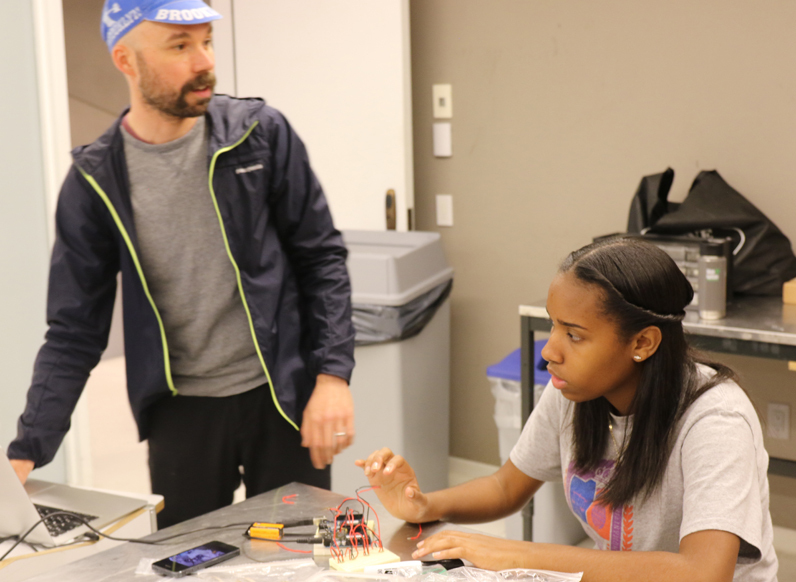 Ryan Raffa, a a part-time lecturer at Parsons who leads the Creative Technology Course, instructs student Noelia Baptista on the design process. Even though she’s only a few subway stops away from Manhattan, Noelia Bautista has always thought of New York’s art and design scene as a world away from her Bronx home. That world got a lot closer when she studied at Parsons School of Design. It was there, last semester, that she took her first step toward realizing her dream of becoming an interior designer. Bautista was one of a dozen high school students in Creative Technology, a partnership between New Visions Charter High School and Parsons that shows students how to marshal cutting-edge technologies in a college-level environment. Under the instruction of Ryan Raffa, a part-time lecturer at the leading art and design school, students learn how to apply technology to “creative problem solving” and, in the process, jump-start a career in their chosen field. The course, which provides New Visions students with high school elective credit, is a pilot program rooted in creative technology and design fundamentals. Students develop a technical foundation, learn design and artist processes and practices, and create their own projects and prototypes. Students document their process with learning portfolios that can be used for applications to design or technology-based colleges. Prompted by the theme of sound and music, students in Creative Technology designed projects such as an adjustable chair that plays music, a teddy bear that sings melodies and an umbrella that raises the volume of a pre-programmed song as precipitation increases. For her project, Bautista created a music box wired to communicate with a computer using Ardunio (an open-source electronic prototyping platform) code that she developed. Interior designers don’t necessarily have a lot of use for breadboards, wires, chips, and microcontrollers. But, by engaging the iterative design process, as well as user testing, sketching, and prototyping, Bautista was able to cultivate the creative skills needed to tackle a wide range of design challenges. For Bautista, taking Creative Technology brought New York’s art and design world a whole lot closer. *An open house for Parsons Pre-College Certificate will be held Saturday, Sept. 12. Led by program director Jessica Walker, the event will feature interactive workshops, tours, talks with Pre-College faculty, and a chance to win a free class. Light refreshments will be served. RSVP online.